We make decorating your living room a more passionate affair. Creativity rules this niche and helps you explore beyond the self-imposed realms of designs with Accent Boxes. Decorative to the core, these boxes have a functional purpose too, but most home decorators look upon them as a refreshing take on home decoration. 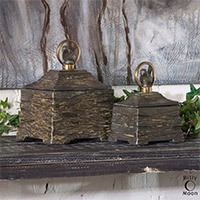 These ornate accent boxes present an interesting interplay of different materials—wood, metal, beads and even glass. Designed with an emphasis on being quirky, playful, and cheerful, these decorative items can be placed on nearly every type of countertop—from centre tables of drawing room to workstations at your office or side tables and dressers. Easy to install and move about, you can mix and match these accent boxes without any rules to follow. We recommend spending a minute on browsing our best performers in this segment—Scotty Wood Boxes and Winola Colorful Metal Boxes. Accent Box There are 22 products.